We all know that the light of everyday devices is bad for our health, but how much? Today is going to be talking about smartphones and their impact on our health. Studies suggest that 60% of people spend more than 6 hours a day in front of a digital device. emitting a bright blue light so it is possible for us to read what is showing on the screen, this process occurs during the bright spots of the day. as it passes the day light are not adjusted for brightness remains the same, this happens to all devices like laptop, TV and other devices as well. what really happens is this light mimics the sunshine and confuses your brain to think is a daylight. This in turn masterminded the release of melatonin, the hormone that helps you fall asleep stops. For this reason, experts are suggesting to turn all the lights at least 2 hours before going to the bad. This hormone it is performed by a small organ located in the brain called the pineal gland. Triggered couple of hours before bedtime. 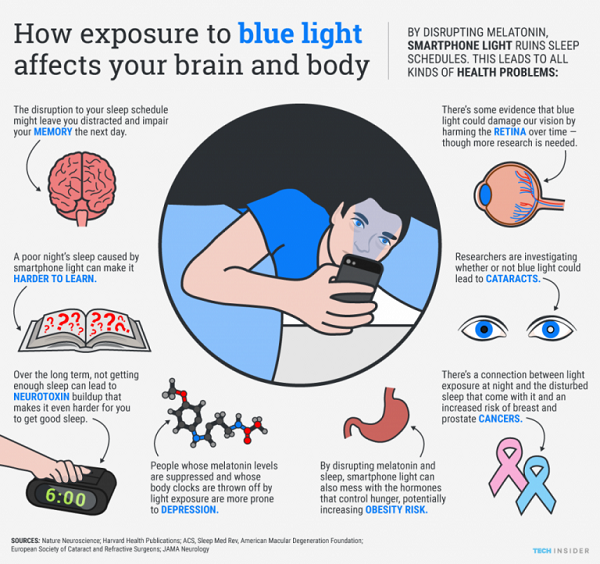 The science of why the blue light emitted by mobile devices keeps people awake led to discovery of a photoreceptor called Melanopsin. Although we have long been familiar with the various rods and cones that build our vision, Melan opsin was recently discovered in the retinal ganglion cell, which are sensitive to blue light. The experts confirmed that an average person has trouble falling asleep when using mobile devices. Adolescents are much more vulnerable then adults when it comes to this situation. The reason for this is the natural circadian rhythm changes during adolescence, causing adolescents to be more awake in a night time. Dr. Martin Blank, Department of Physiology and Cellular Biophysics at the University of Colombia has joined a group of scientists around the world who are making an international call to the United Nations regarding the dangers associated with various electromagnetic emitting devices such as cell phones and Wi-Fi. Besides sleep disorders, there are many more serious problems caused by this particular problem. As mentioned younger people are more affected by this situation, it is important to mention that the child’s brain absorbs up to four times more radiation than an average adult. And the alarming fact is that children are more occupied with these modern devices. The time we spent sometimes on the screen of our devices is simply too, in China this is currently considered as a clinical disorder. Due to this fact, we have established rehabilitation centers for people who are addicted from the screen. can also download an application called F.lux, which adjusts the color of the computer screen to the time of day -. Heat at night and brighter during the day – and cut the blue light emitted. There are similar applications for mobile as well. All of us here in the EC use these applications and have really noticed an improvement in sleep quality.